Keep the summer vibe alive! 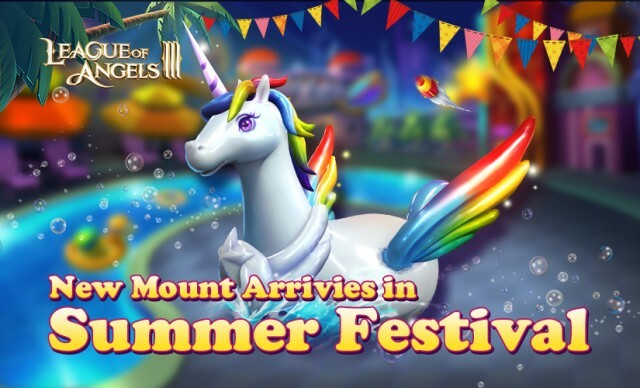 League of Angels III is introducing a brand new mount – Summer Unicorn in this week’s update for summer festival! Reflecting the desire for romanticism and purity, Summer Unicorn is the carnival themed mount which will be released on September 11th and available for all players during the summer carnival. Let’s see what surprises this dreamy mount will bring us ahead! Although a fictional creature in mythology, the unicorn has always a wonderful charm that you can’t resist when you combine the unique helix angle and the colorful wings. As an advanced mount, Summer Unicorn is a legendary mount that can significantly boost the battle rating of your heroes while adding immense bonus HP, ATK and DEF. From September 12th to September 18th, all players will be able to obtain the sigil to unlock the Summer Unicorn and possess it for 10 days after logging in and completing certain tasks. If you want to possess this lovely and powerful mount permanently, you can try your luck in “Wheel of Fortune” event which will be available from September 14th to September 16th. Don’t miss them out! Are you looking forward to adding this fabulous creature to your collection? Hurry up and join us in the summer carnival in League of Angels III!